A discrete oscillator circuit shown in the schematic diagram below is a variable duty cycle and variable frequency oscillator, can be used to produce rectangular wave. This circuit has frequency range of 60 to 1,000 Hz. 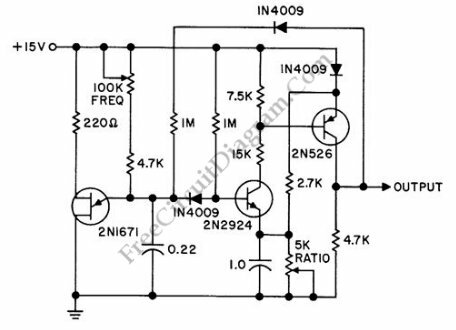 This circuit consist of one UJT (uni junction transistor) and two transistors that provide positive going output when emitter voltage exceeds NPN emitter voltage.